Why I read this book: same reason I read any book: I wanted to. Summary from NetGalley: "There's something drawing Lena to the water. It's making Lena sleepwalk to the beach. It's compelling her to surf even if it means putting herself in grave danger and going against her father's wishes. A woman emerges from the waves — a woman with a silvery tail. When Lena finds a brown leather sea chest and uses the key to unlock it, she has no choice but to look into the watery depths of her secret past through the mysterious mermaid's mirror... Lena's life will never be the same." I've probably watched the Little Mermaid a thousand times as a kid, I think it drove my parents nearly crazy. I can probably still sing along with all the songs, I was always particularly fond of Part of Your World and Under the Sea. So I was really excited to be reading a YA fantasy about mermaids for a change! They're so much more graceful and colorful than all those vampires and werewolves roaming around. Lena has always loved the sea and goes there with her best friend Pem and boyfriend Kai (who used to be her other best friend) all the time, watching them surf. Her father nearly drowned while surfing once and because of that doesn't want Lena anywhere near a surfboard. Other than that, Lena's home life is pretty nice. Her mom died when she was 4 years old, but her stepmom Allie fills the void she left behind. And she has a baby brother who she loves very much. Magic Crescent Cove in particular, where only the most experienced surfers go and seeing a woman with a silvery tail amidst the waves.She struggles with the concern of her family, the awkwardness that exists between her, Pem and Kai ever since she and Kai got together and with being with Kai in general. Lena decides it's time she learned how to surf herself and takes lessons from Kai's sister. She's a natural and in no time is surfing on her own, of course at Magic's. Sure enough, this goes wrong and she's rescued by someone who no one on the beach remembers seeing afterwards, who gives her a golden key. Now Lena must find the lock the key fits to and discover what's really in her family history. I really enjoyed reading this book. I thought it was so refreshing that Lena has a stepmom, but loves her very much and she generally has a healthy family situation. You come across so many books these days where this isn't the case. Of course, there are fights and secrets, but those aren't there just for the sake of drama, they really have to do with the main storyline. I also loved Cole, Lena's little brother, who in the end plays an important part, though he probably doesn't know it. The scenes with Kai and Lena were uncomfortable, not that they did anything other than kissing, but I didn't feel like Lena really wanted to be with him. This is explained further along in the book, but upon first reading these it was a bit awkward. Major props to the author for not being overly obvious, but still managing to instill a feeling of unease. The part I loved best was after Lena finds the mermaid's mirror, then the story is really propelled forward and is just heartbreakingly beautiful. I thought the ending was a bit rushed and I'm sad this isn't part of a series, I could have explored this world for much longer. 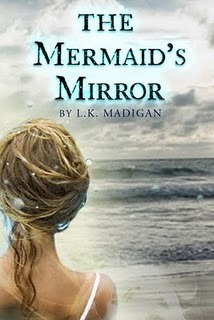 I'm hoping Madigan will write a sequel because I want to know what happens to Lena and her family! The images Madigan paints from the underwater world are beautiful and I was transformed back into a kid admiring Ariel's world. All in all, Lena was a likeable character and my love for mermaids is renewed after reading this book. I wrote this review back in September for my personal blog and was sad to learn that the author has recently been diagnosed with pancreatic cancer, which is a horrible, horrible disease. If you want to show support, head on over to her blog and leave a message. She and her family will be in my thoughts in these hard times. I saw this at the library. What a great review. It sounds like a wonderful book. I am so sorry the author is so sick. Great review! I'm so glad to hear that you really liked it! I should have this one coming to me soon! So excited! Thanks for your insightful review! And also for your thoughts and kind words. L.K. 's D.H. Happy Valentines Day, everyone. i just checked the book out from my library and wasn't sure it was worth reading because i love these kind of books and have a high expectation.